This event is the next in a series organised by the Localising Leanganook network. The sessions commence with a brief talk, opening into a circle discussion on topics that re-localise our economy, social connections, our ecology and our public life. John Terry will share with us some of the philosophy and experiences of Castlemaine’s Rites of Passage program with boys and men, which has been operating over the past seven years. John attended the first rites of passage event seven years ago and has been part of the facilitating team since then. Rites of passage are intrinsic to many cultures around the world. In these traditional communities boys, on reaching puberty, are taken into rites of passage both to acknowledge significant transition they are moving through and to acknowledge each young person’s uniqueness. There is ample evidence that young men could well find their own ways, often involving risk taking behaviour, if adults in their community don’t provide rites of passage experiences for them. Many boys do not relate to images of being a man commonly portrayed in media and on the internet, which can leave them feeling unseen and trying to play out roles that are not authentic to themselves. Castlemaine Rites of Passage is a group of local men, all volunteers, who have seen the lack of rites of passage in our community and chosen to do something about this. 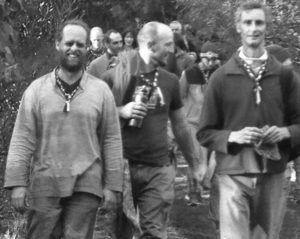 In 2010 and 2011 men from a community group in South Australia were invited to Castlemaine to run rites of passage events for boys and men with the intention of seeding a local group. Since that time the local process has continued and evolved, focusing on acknowledgement, support and celebration of participants as guiding principles. The program centres around a long weekend shared together out in bush in the Mt. Alexander area. Participants are challenged in different ways whilst spending time connecting with men, the natural environment and themselves. Participants are supported to be present to the challenges as well as joys of transitioning into manhood in our society. The program involves families and the broader community in support of the boys and men participating. Join us on July 2nd for this conversation followed by a shared meal. 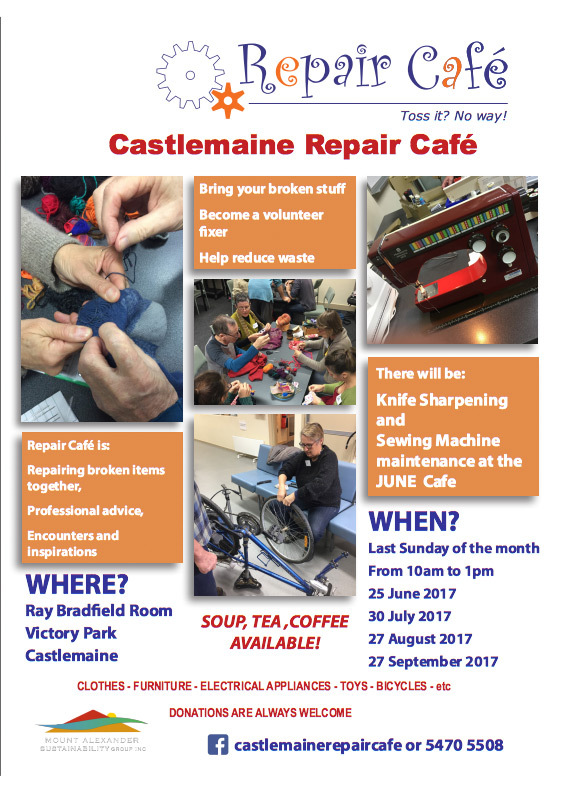 Don’t toss it away, bring it instead to the Repair Cafe- held on the last Sunday of each month. The next repair cafe is this coming Sunday June 25th from 10.00am until 1.00pm in the Ray Bradfield room. This cafe includes knife sharpening. Genevieve Barlow stimulated our May conversation by sharing some of Newstead’s journey to renewable energy since their 20/21 summit in 2008. Acknowledging ‘those whose shoulders we stand on’ and committing to ‘do no harm’, Genevieve reflected on local people taking the initiative, allowing time to really form ideas, meeting only when necessary so energy levels can be maintained over what has been a ten year period. Renewable Newstead is committed to the creation of commercially viable, locally generated, renewable energy for the town, commercial viability being one of the trickiest aspects. At the ten year mark, the project is in a critical phase and Genevieve emphasized the importance of deepening community engagement and of having a mix of people and skills in the group. Choosing not to go down the energy retailer path, partners have been sought. Community discussion ranges over a variety of issues including the creation a business case, energy audits for houses, the value of the grid in Newstead, how to make the energy price lower than now, bringing down peak use, battery options, education, buying and selling energy within the community and energy use. With significant public monies from the Victorian State government Genevieve acknowledged risks of this project from the government’s point of view and the potential impact that Renewable Newstead’s experience may have on other communities, particularly where the network needs upgrading. ‘Whilst it makes so much sense to generate local energy’, Genevieve said, ‘there remain questions and complexities about the grid’s capacity’ to integrate significant quantities of local renewable energy. In reflecting back, Genevieve’s summary words of wisdom were: always get social licence from the community; draw on local people; don’t over-meet, acknowledge initiatives such as these are a long haul; remember we stand on others shoulders; and go where the people are at. Recently, Daylesford Town Hall filled to overflowing with people, from central Victoria and beyond, whose lives have been enriched by local organic farmer, greens politician and environmentalist Rod May. Many of us have been nourished in body and in spirit by Rod. 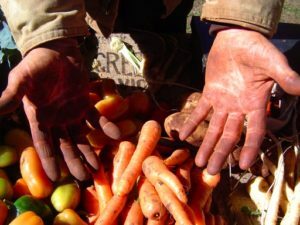 Here are Rod’s hands and an excerpt of Steph Hodgins-May’s eulogy to her father, Rod. Working bees are happening at Rod’s farm in Blampied. Contact Nikki if you are interested in helping out. Democracy 4 Dinner will meet to discuss “Uluru Statement from The Heart”. Format and venue to be announced in the coming weeks. An action is planned at the Bendigo Commbank on Friday July 14th at midday with people “measuring themselves up” inside the bank in case the bank board meeting in August rules in more coal. This action will include school aged children and occur during the school holidays. CommBank board met on June 13th to discuss their proposed climate policy. The board required more work to be done on policy to be submitted in August 2017. Keep up the pressure by placing ‘Out of order’ stickers on CommBanks ATMs across Victoria and sign the community letter to be presented to Federal MPs expressing community concerns regarding the proposed Adani mine and requesting MPs oppose funding this disastrous mine. 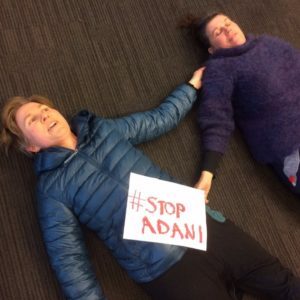 Plans are afoot for a Stop Adani Network Meeting hosted by Central Vic Climate Action- possibly July 29th in Castlemaine. To get up-to-date information, add your name to Central Vic Climate Action’s email list and follow their facebook page.